A grandmother won second prize in a cake-baking contest at a fete, only to discover she was the only entrant. 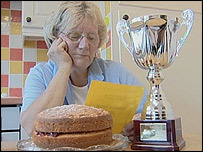 Jenny Brown, 62, entered her Victoria Sponge into the competition and was initially pleased to have come second. But she was left shocked when a friend revealed to her that she was the only person to take part. The contest was organised by the Wimblington Sports Committee and judges marked down the cake because it had indentations from a wire rack. Ms Brown said: "My friend came over to me at the fete and said I had come second. "I asked her how many more entries there had been, but she just started laughing and said I was the only one. "I definitely wasn't annoyed about it." Although the cake was not deemed fit to win the competition, Ms Brown said it was soon polished off with no complaints. Julie Dent, from the Wimblington Sports Committee, said: "The judges had an expectation and I suppose they didn't feel as though it qualified for first place. "This was the first year but the cake competition will become an annual event." She said her own baking was subject to another strange decision. "About 11 years ago I entered a show with some fruit scones. I was the only entrant but I came third."